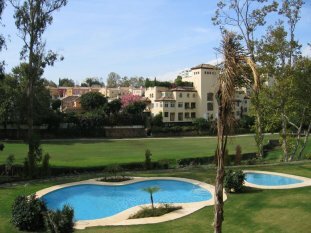 This brand new luxury apartment has two large bedrooms,two bathrooms,kitchen, dining and sitting room and a large south facing balcony. The kitchen is fully equipped. The apartment has air conditioning/heating, piped music system, two televisions and DVD player. There is underground parking with lift access and the community is gated with 24 hour security. The apartment comprises two bedrooms;one double and one twin. 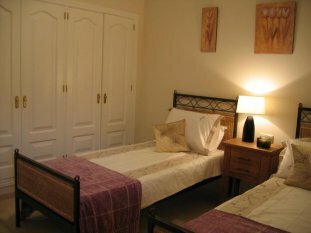 The double bedroom has ensuite facilities. 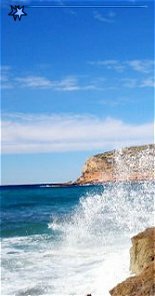 Bed linen and towels are provided for your use along with a hair dryer. The master bedroom has 21 inch TV. 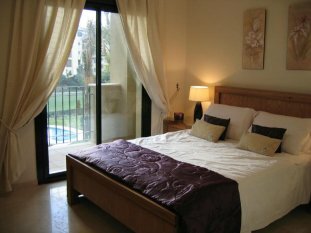 Both bedrooms are very confortable and tastefully decorated. The kitchen is equipped with hob, oven, microwave, fridge freezer, kettle, toaster. There is also a dishwasher, washing machine, iron and ironing board. There is cutlery ,crockery, glassware and cooking utensils. There is also a table along with four chairs. 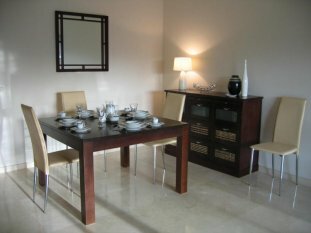 The dining area consists of a beautiful mahogany table and chairs along with a sideboard. There are very comfortable two seater and three seater leather sofas along with coffee table for your convenience. There is also a 28inch TV with cable/satellite connectivity along with DVD player. 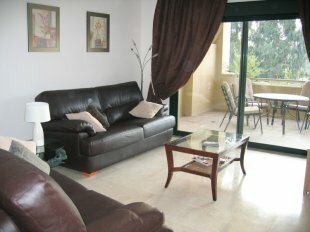 This room leads through french windows onto the balcony furnished with comfortable table and chairs. 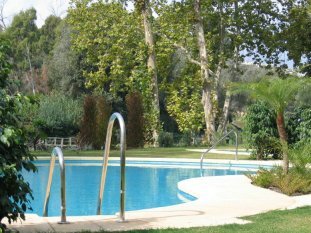 The apartment overlooks a beautifully landscaped pool area with main pool and childrens' pool. There is also a gym for use by all residents. The beach is a 3 minute drive away.